It is snowing outside which means I am done teaching archery for the season. Winter for me is time meant more for teaching ice skating, boxing (indoors) and personal training. So if you are looking to learn ice skating, boxing or are looking for a personal trainer feel free to contact me. 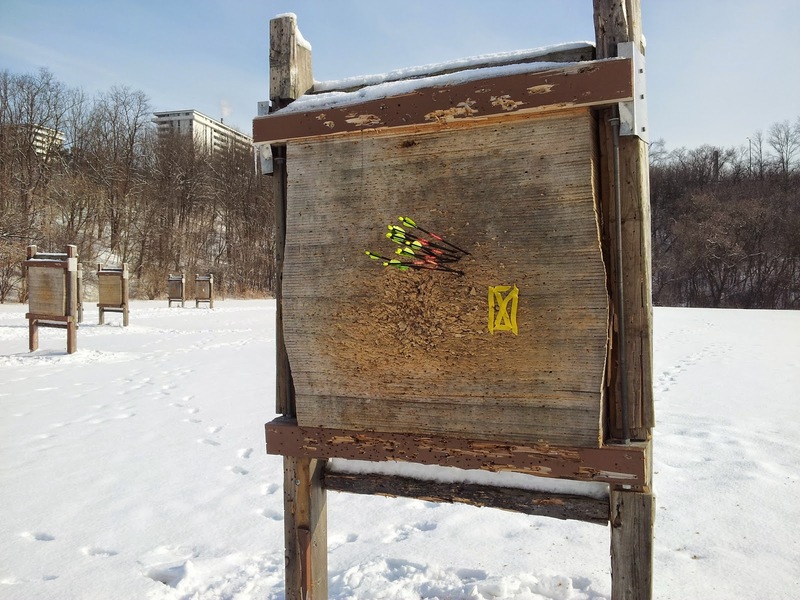 For people who want to get into archery and are looking for archery lessons in Toronto, you can prebook lessons for Spring and Summer 2015 right now. And by right now, I mean contact me right away because people started prebooking for 2015 back in August 2014 so some of the time slots in April and May are already fully booked. When Prebooking Archery Lessons I require a 30% deposit for the total sum, payable via Interac Email Transfer from your bank. If the lessons are not for you but are for your friend, significant other, child, parent, boss, colleague, etc. and you are not sure when to schedule them then I also offer Gift Vouchers. The prices of the Gift Vouchers are the same as my regular rates so browse my Archery Lessons page to see my rates, and learn more about my services. Payment for the Gift Voucher is done via Interac Email Transfer from your bank. Lost voucher? Email me with your contact information, who purchased the voucher and the value of the voucher and I can send you the voucher number. All you need is the voucher number to redeem it. Tip: Aim in the corner if the target butts are damaged. Ideally I would prefer to teach archery lessons indoors during the colder months but we have to make do with what we have. Last year I made an exception in February to teach a single archery lesson to a student who wanted to get into bowhunting. 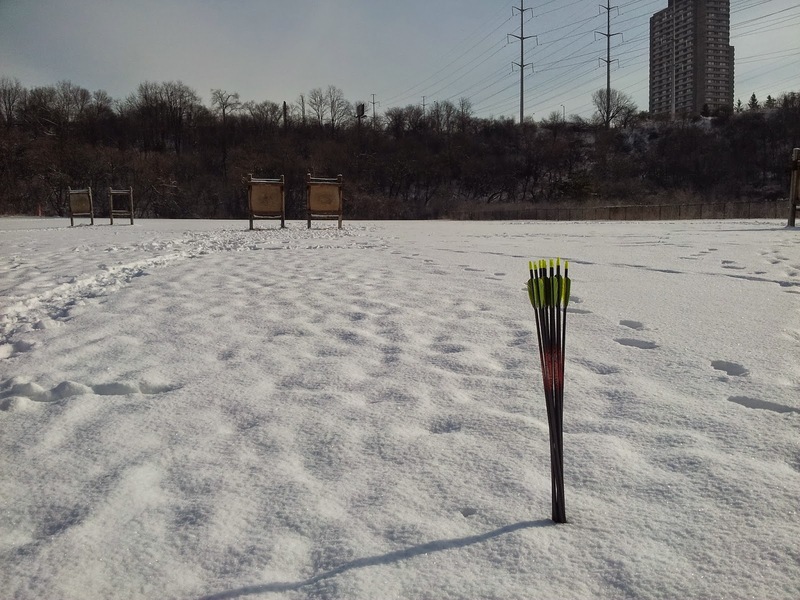 So it is not impossible for me to teach archery lessons during the winter, but it is a case wherein I prefer to wait for the weather to cooperate and I do prefer to teach only those students who are unwilling to wait for Spring because they have a dire urge to learn immediately. 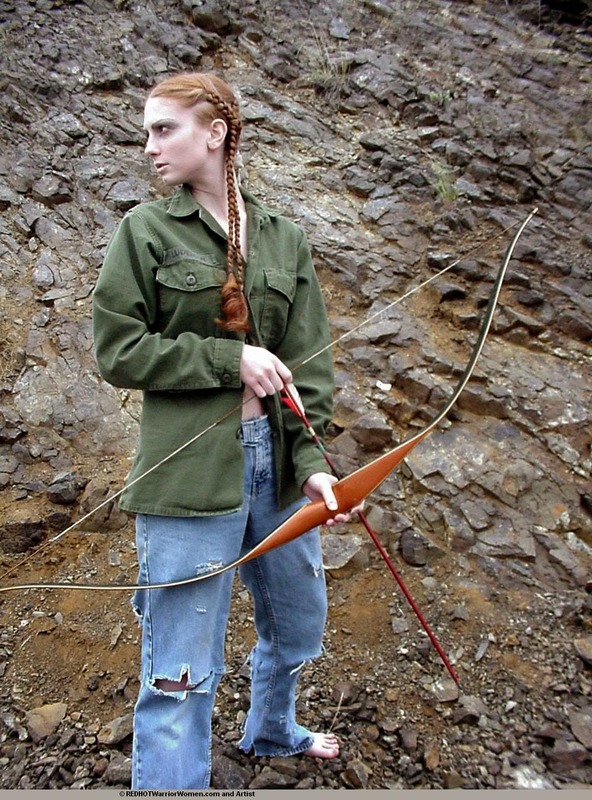 I add an extra $20 surcharge for Winter archery lessons because the probability of lost arrows is much higher and because I want to discourage people who are less than serious. All lessons are dependent upon cooperation from the weather. If the weather is too foul / blizzard-like, we will reschedule for a nicer day using the 14 day forecast and confirm the weather conditions the day before the lesson. 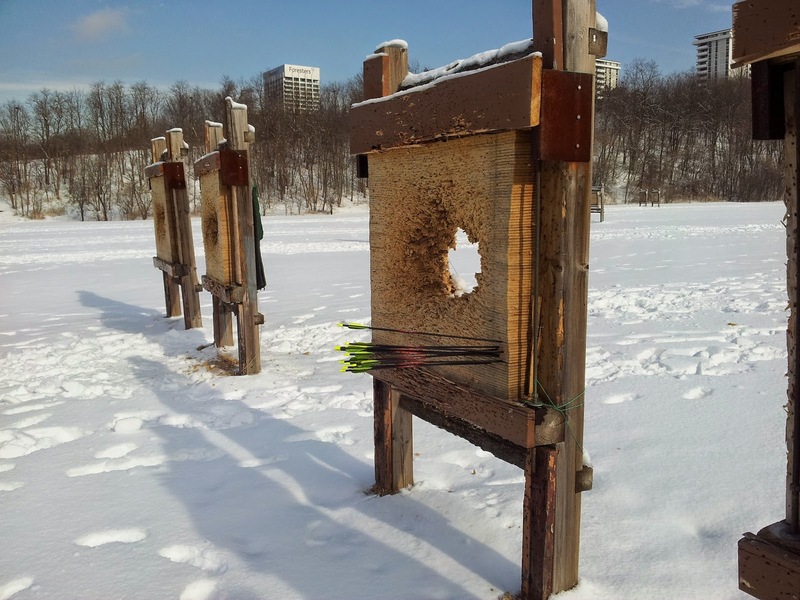 For tips on doing archery during the Winter please read Guide to Winter Archery in Toronto. 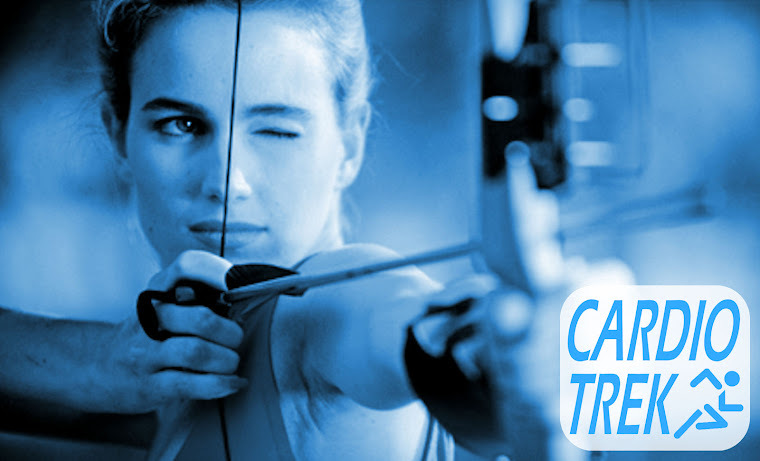 To contact me regarding prebooking archery lessons, purchasing a Gift Voucher, or scheduling a Winter archery lessons you can email cardiotrek@gmail.com. I am cross dominant (right handed but left eye dominant). I find it very awkward to pull back and shoot using my left arm. Is there anything to do to rectify this problem? I have tried shooting with my right side instead, but my accuracy that way is horrible / worse. Help?! First, for my readers I am going to clarify what it means to have a dominant eye and to be cross dominant. Your dominant eye is the one people aim with. It doesn't necessarily match up with which hand is dominant. Roughly 15% of people are left eye dominant, and while some of them are left handed, quite often there is a percentage of people who are right handed and left eye dominant (or the reverse, left handed and right eye dominant, although that is more rare). To check which eye is your dominant one please read the Eye Dominance Test page and follow the instructions listed there. #1. Practice, practice, practice. The act of doing archery will make your left arm / left side stronger and you will eventually be able to pull the bow with ease. How you increase the manual dexterity in your off hand is a matter of debate. I recommend juggling with three balls or juggling two balls right-to-left because it forces you to be catching/throwing the balls with your left hand instead of just your right. If you only juggle with two balls then use your right hand to be catching the balls and your left to be throwing them. Usually most right handed people shift the ball left-to-right when juggling two balls because they are catching with their left hand, shifting the ball to the right and then the right hand is throwing the ball up again. By reversing the process, you are forcing your left hand to catch the ball being shifted to the left, and to be tossing the ball accurately in the air. This will take a lot of practice to master. Days, weeks, maybe even months. It takes time for people to work their way up to juggling three balls (which requires that both hands be equally dexterous), so juggling right-to-left will be a good stepping stone to eventually learning to juggle 3 at once. However once mastered juggling with your left hand, it should have dramatically more manual dexterity and won't feel so clumsy when you are trying to shoot with it. If you have read some of my past topics about Frugal Exercises then you know I am a big fan of people exercising without having to spend a lot of money on the activity they are doing. People should not have to spend oodles of money on a "Bow Flex", "Shake Weight", etc. eg. 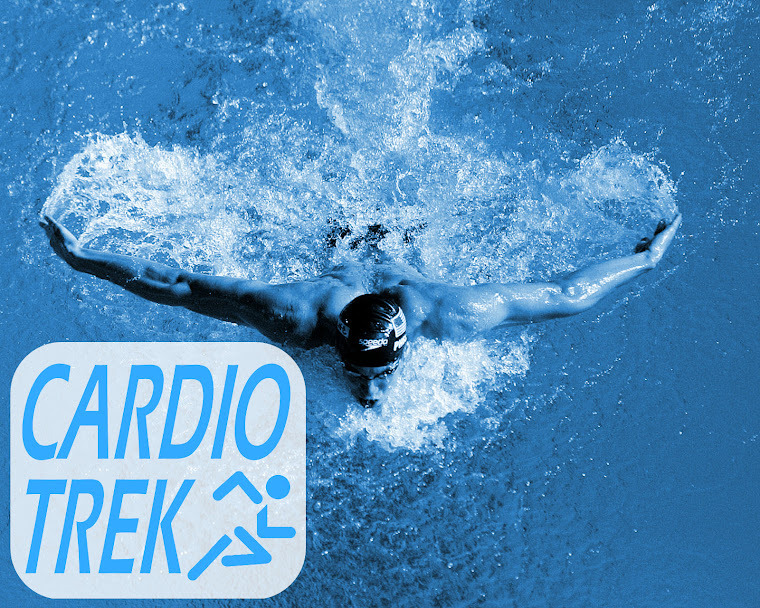 In 2014 one of the biggest exercise gadgets being promoted is bracelets and watches that estimate how many calories you are burning, your heart rate, how fast you are jogging, etc - often with attachments or Blue Tooth that attach to your phone. But do these gadgets actually get you exercising? No. Do they allow you to miraculously lose weight more effectively? No. All such gadgets seem to do is remove money from your wallet in an effort to nerdify your workout (assuming you actually have a workout and the gadget doesn't end up collecting dust in a shoe box). For example if you browse a list of such gadgets you are just as likely to see "Bicycle Helmet Camera" or "Earbuds for listening to Music" on the list of gadgets, as if the camera will cause you to actually go out and bicycle, or the earbuds will cause you to jog and listen to music while you jog. More likely the camera will get used once, and the earbuds will be used more often on the bus or subway en route or coming home from work. But enough ranting. Lets talk about archery equipment. Buying archery equipment is expensive right from the get go. Expect to spend anywhere from $120 to $350 on your first bow if you go into an archery store and ask to buy their cheapest bow. Then you also need arrows, bow stringer, finger glove (or tab or thumb ring) to protect your shooting fingers and a bracer to protect your bow arm. Quiver, store-bought targets / target butts, spare bow strings are optional. If you want the really nice equipment, expect to be spending $400 to $900 - or $1,000 to $3,000 on the super expensive equipment. I have seen many archers using homemade bows and performing shots that would make their ancestors proud. 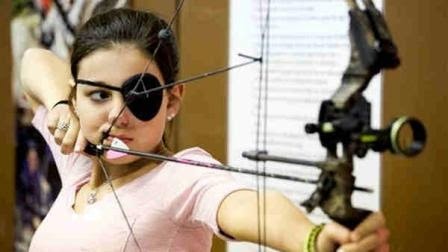 So you don't need a store bought or expensive bow to do archery. But I should say however that bow making is not easy. Bow making is both a craft and an art form, because it relies on knowledge of the materials - but also on an understanding of how to make a bow which shoots effectively. So the question then becomes, how do you do archery on a frugal budget? Well, it depends on how frugal you want to be. For example, I know it is possible to make a trilam bamboo bow for only $20 worth of materials - but you will end up spending closer to $60 just on tools, and making a trilam bamboo bow requires a degree of woodworking skill that is beyond most first time bow makers (and even moderately good woodworkers). You can even buy kits for making your own bow (see http://basicallybowsarchery.com/Bow_Building.html) for roughly $120, but I think we can find a style of bow that is even cheaper and easier to make. Which brings us to the topic of PVC. There are plenty of videos on YouTube about making PVC longbows, PVC recurves and many other styles of PVC bows. They're all super cheap, costs you about $5 to make the simplest designs, or closer to $50 if you want to make something more complex. A good YouTube channel to watch on the topic of PVC bows is BackyardBowyer. But I have an issue with PVC bows. I have seen many people at the archery range using PVC bows, and they all inevitably break. Often in a spectacular way, which is to say a horrendous cracking noise as the PVC splinters and explodes in different directions. I have yet to see an injury from an exploding PVC bow, but they do happen. Bhutan man using a homemade bamboo bow. 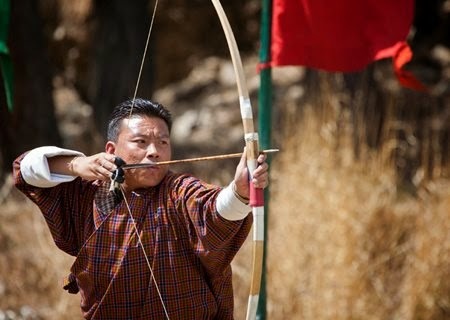 Archery is the National Sport of Bhutan. Thus my recommendation for a frugal bow is going to be a different material entirely: Bamboo. Get a thick 6 foot long piece of bamboo in Toronto's Chinatown. Approx. cost $5 to $10. Using a saw, hack saw, band saw or whatever kind of saw you have handy cut the bamboo lengthwise into 3 or 4 flat pieces. Once you have the three or four pieces you need to smooth down the bamboo so it is nice and flat on the interior side (how you do this is up to you, I recommend rasps and sandpaper). Option 1 - Laminate 2 or 3 of the bamboo pieces together using wood glue or epoxy. Epoxy works best as filler, whereas glue needs to be pressed between two tight surfaces. For best results get the bamboo super flat and then use TiteBond 3 wood glue. Note - You probably don't need to use more than 3 pieces of bamboo to make your bow, using 4 pieces might make your bow too strong and impossible to pull. Use your own judgement and realize there may be some experimentation. Option 2 - Skip laminating the bamboo together and instead wrap it tightly together using sinew, rawhide, or even duct tape... Duct tape is your cheapest option. Option 3 - Laminate with glue AND wrap it with sinew. Option 4 - Don't bother using multiple pieces of bamboo to make the bow, use a single piece - the bow will be very weak but functional. Cut notches into the tips for a bow string + make a bow string out of twine, linen, silk, sisal, B55, B52 Dacron, etc. String your bow and give it a few tries with an arrow in the safety of your garage/basement/etc. 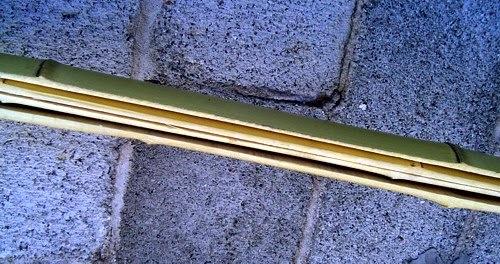 The great news about working with bamboo is that you can basically skip the normal tillering process of making a bow. Bamboo has amazing tensile strength and flexibility - making it ideal for bow-making. The end result is a bow which is functional and which will work better than any 'stick bow' you could make using found materials. Made well it will work just as good as a PVC bow, but without the danger of the PVC breaking / exploding into sharp pieces. You will also need arrows, a bracer, a fingerglove (or tab or thumb ring) and possibly a bowstringer (although for a homemade bamboo bow, a bowstringer might be unnecessary). Volumes II, III and IV are also good, but Volume I is the most important book because it covers all the basics of selecting/seasoning wood, design, tillering, arrow making, glues, etc. If you are remotely good at making things with your hands you can probably figure out how to make a wood, bamboo or PVC bow. It doesn't take a genius to make something that works, but it will take several tries before you can make something you are truly proud of. But hey, learning is a journey and you only get there when you take the first step. Food can have dramatic side effects on the body. Caffeine, alcohol, chocolate for example each distinct side effects on the human body. But a lack of certain types of food can also result in metabolic or nutritional deficiencies which can lead to psychological disorders - including side effects like depression, mood disorders and anxiety disorders - to say nothing of eating disorders. Patients have no idea why they are feeling so awful or where to start looking for the answer. They expect their doctor to give them real solutions, and doctors end up pushing pills on them as a bandaid solution. Drugs are the easy fix, but they're often not the final solution because there are serious side effects that come with taking powerful anti-depressants. Doctors prescribe anti-depressants using information they get from drug sales reps and every time they prescribe an anti-depressant they get paid a commission (even though you collect your prescription from the drug store). The side effects and dangers of these drugs are down-played so that patients don't realize all of the pros and cons of the medication. The problem is doctors are prescribing these medications without first ruling out dietary deficiency as a cause. Some doctors have realized that many patients refuse to change their diet and thus go straight to prescribing pills because they think the patient is unwilling to change their diet. Every winter millions of people get the "Winter Blues", a depressing funk from being inside all the time and not getting enough vitamin D. People can get the "Winter Blues" any time of the year however. All they have to do is avoid sunlight for 2 or 3 months and barely eat any vitamin D, they will get depressed quite easily. If you suffer from depression or mood/anxiety disorders it is possibly you may simply be deficient in one of the nutrients below. Scientific researchers have determined that many people who suffer from depression and mood disorders are deficient in not just one nutrient but several, all contributing to the symptoms. So pay attention because it is possible you are missing out on several key ingredients for your happiness. Does your diet contain too much sugar, junk foods, sodas, or processed foods? Do you often skip meals? If you suffer from depression or mood disorders, one solution is to start a food diary of the foods you eat every day and then compare the results at the end of the week with what you should be eating. Chances are you are not eating enough fresh vegetables or fruit and this is extremely common in North America for people to have a nutritional deficiency from lack of veggies and fruit. Omega-3 Fatty Acids are found in foods such as fish, fish oil and Flax Seed Oil. A deficiency of Omega-3 fatty acids or an imbalance of Omega 3 and Omega 6 fatty acids could be the cause of your problems. Omega 3 Fatty acids are important to brain function and your mental outlook on life, a lack thereof results in a feeling of sluggishness and uselessness. Omega-3 Fatty Acids also help people who suffer from inflammation and pain problems. Researchers have found that the vast majority of patients with depression and mood disorders are deficient in Omega 3 Fatty Acids. Conclusions from #1. and #2: Eat more fish, salad and veggies. 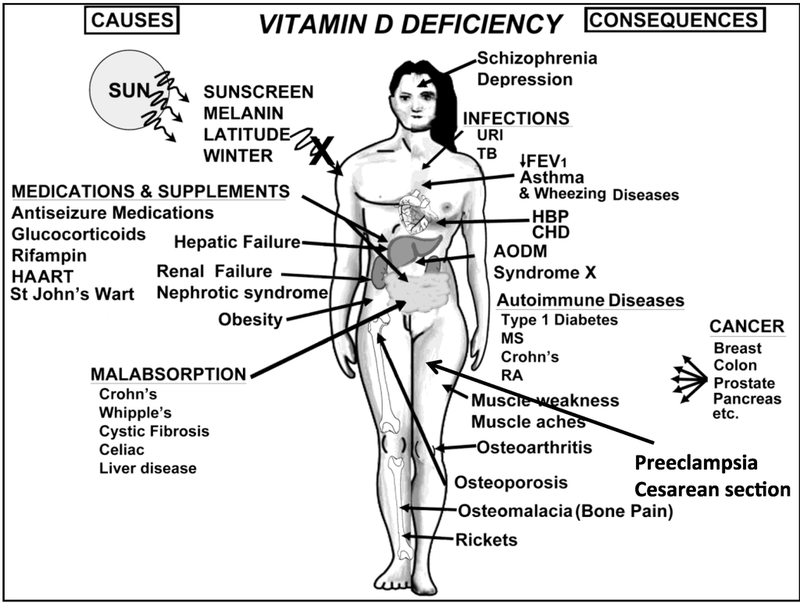 I already mentioned Vitamin D above, but Vitamin D is also important for your immune function, bones, and brain health. Sunlight is the richest source for the human body making its own natural Vitamin D, but during winter months you need to be eating more Vitamin D in order to compensate for the lack of sunlight. A 2013 study determined that Vitamin D deficiencies are present in patients with depression, panic disorders and especially Alzheimer's. So to combat this you can go outside more, take Vitamin D supplements, or eat more foods containing Vitamin D like fish, eggs, milk, and cheese. In recent years Neuropsychiatry has proven the link between B-Vitamin deficiencies and mood disorders including depression. But there is a solution for this. Take a vitamin pill that contains 25 mg of each of the different B-Vitamins included in the pill. Vitamin B rich foods include fish, meat, nuts, dairy products, leafy greens, carrots, tofu, eggs. Patients with depression are often found to be deficient in many minerals. Many modern processed foods contain almost no minerals or only trace minerals. Whenever possible, eat normal non-processed meat, veggies and fruits. Iodine is necessary for your thyroid to work properly. The thyroid is part of the endocrine system and is one of the most important glands in your body. The thyroid gland affects every function of the body including body temperature, immune function, and brain function. Iodine is found in foods such as potatoes, cranberries, Kelp, Arame, Hiziki, Kombu, and Wakame. Decades ago people used to eat Iodine enriched salt, but these days iodine deficiency is again becoming a problem with salt free diets. So if you're not a fan of the veggies mentioned above, try eating some salty foods instead (eg. salt-water fish). Amino Acids are used to make neurotransmitters in order speed up brain function and control emotional stability. 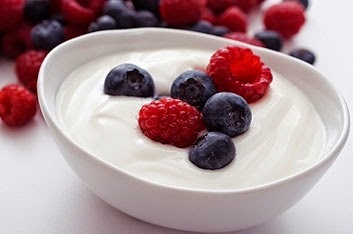 There are 9 necessary Amino Acids that cannot be manufactured by your body and can only be attained by eating food. The Amino Acids you need are found in meat, eggs, fish, high quality beans, seeds and nuts. You also need to eat a variety of different foods to furnish the body with all the amino acids needed to be healthy - you can't just choose one and eat only that because not all foods contain all nine amino acids. A great source for amino acids is Moringa Oleifera leaves. Overwhelmed neurotransmitters caused by an Amino Acids deficiency results in an imbalance between emotions, resulting in many different kinds of mental disorders. Dopamine, noradrenaline, and GABA are three important neurotransmitters often deficient in depression. You can test for this deficiency by visiting an Orthomolecular doctor who will test your blood and urine to check your amino acid levels. Unlike regular doctors who just prescribe anti-depressants, Orthomolecular doctors treat the base cause of the deficiency and can tailor make a treatment program for the person. Thus if they notice a deficiency, they will recommend you eat the appropriate foods or take supplements. 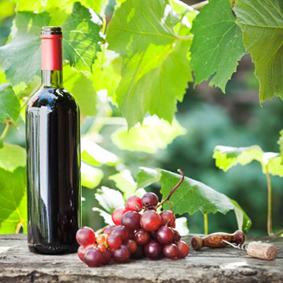 There are tests that prove nutrient deficiencies. You just have to ask your doctor for a Nutrient Deficiency Test. The problem however is most medical doctors in the USA will not give clearance for the tests, nor will your insurance pay for them - so if you are American and want this test done you have to pay for it yourself. In Ontario (and the rest of Canada) however the test is covered by OHIP (because the Canadian government knows they save money in the long run if people make the choice to safeguard their health and have the test so they know how best to do this). So huzzah! Isn't Canada awesome? I have two problems when I am doing archery. I cannot close my left eye when I am trying to aim. If I close it I end up closing/squinting my right eye too, so much that I can barely see the target. I find I have problems aiming with both eyes open because it makes double vision. The second problem is my long hair has a tendency to get in the way. Aside from cutting off my hair or wearing a hat, what can I do to counter my hair getting in the way of my eyes? I have encountered people with the problem that they cannot close their left eye before and I have a very simple solution: Wear an eye patch. It may feel silly but many archers in your position do it. Some of them even have decorative eye patches made. 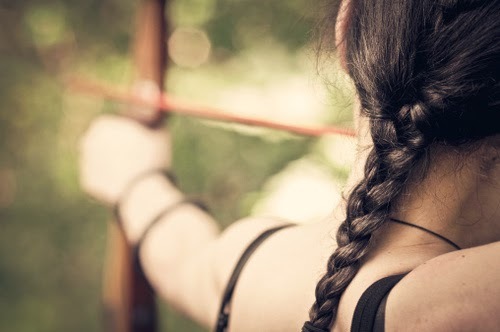 Now you know why Katniss in the Hunger Games wears her hair in a braid. This is the quickest, most effective solution to your hair problems. Just braid your hair, tie it back, make a ponytail, pigtails, etc. You could even put your hair up in Princess Leia buns if you wanted to. 1. Bandanna to hold your hair out of your face. 2. Hair barrettes to hold your hair in place. 3. Bows / ribbons holding your hair in place (feel free to make jokes with your fellow archers about how many bows you are using at the same time). 4. Wear a toque or knitted kufi hat. 5. Get a perm. Curly hair is more springy and won't get in your eyes so much when you are shooting. Below are three common questions students often ask when it comes to compound bows. 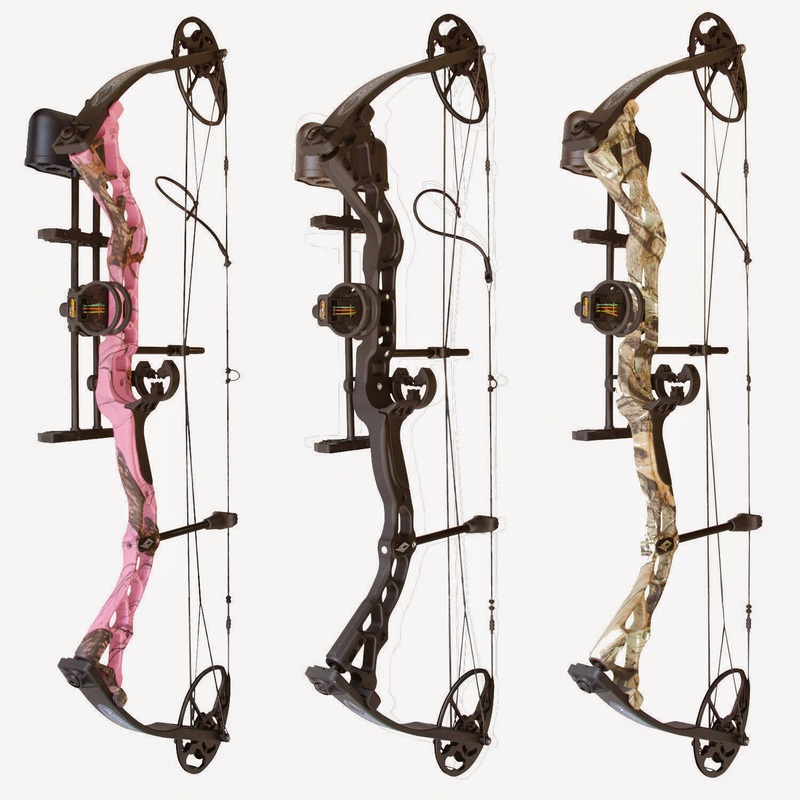 "I recently purchased a compound bow and I don't know how to adjust the draw length. How do I do that?" Step one will typically be to unscrew the top limb bolt (where the limb meets the riser) using an Allen key / hex key. Doing so lowers the poundage of the bow on the top limb. Start by rotating the key 2 full circles. Step two, unscrew the bottom limb bolt 2 full rotations. Step three, repeat step one and step two until the limbs are at their maximum lowered poundage. Keep track of how many full rotations you used for both top and bottom limbs. Step four, consulting your owner's manual adjust the pins on your top and bottom cams to the desired settings for the draw length. Step five, rescrew the bottom limb 2 rotations, then the top limb 2 rotations, and keep repeating this process until both top and bottom limbs are back at the original settings (so the draw weight is once again returned to the same amount). "How do I adjust the draw weight?" If you already read the answer to Question One, this part will be easy. You adjust the draw weight by either unscrewing or screwing both the top and bottom limb bolts equal amounts until you get to your desired draw weight. You will want to use a draw weight that you can pull back easily. If you feel like you are going to rip your muscles or that it is almost impossible to full back, then it is too heavy for you and you should lower it to a more manageable draw weight. Note - For hunting purposes you would still need to use a draw weight that is equal to or above the legal minimum for your prey. eg. In Ontario the legal minimum for deer is 39.7 lbs, and for moose / elf / black bear the legal minimum is 48.5 lbs. Determining the precise draw weight requires a gadget to measure to the draw pull at "the Wall" (the point at which the draw weight while pulling back is at its highest point). Most archery stores have such a gadget on hand and can tell you the precise draw weight when they setup your bow for you. Experienced archers can also estimate the draw weight of your bow just by pulling it back and giving their best guess based on their past experience. "How do I adjust the sights on my compound bow?" For this one you really should sign up for an archery lesson. 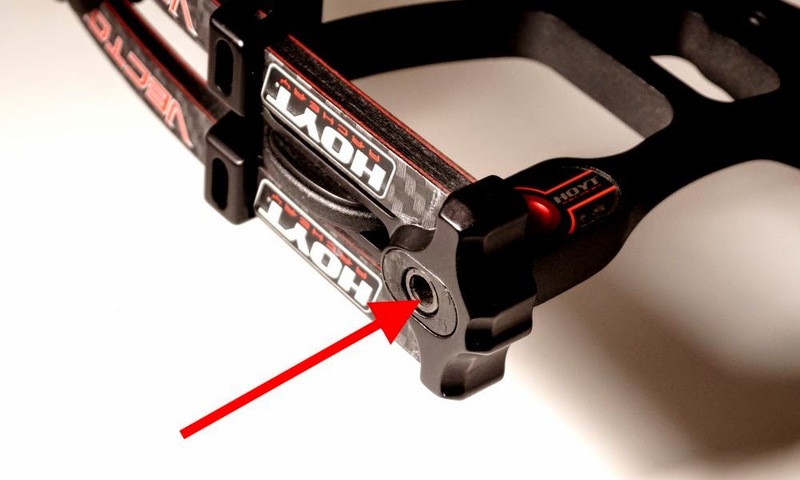 Beginners have a tendency to make all sorts of mistakes when adjusting the sights on their compound bow so it is a case wherein you are best guided by someone who has experience adjusting the sights to help tune your compound bow so you get the utmost accuracy out of your equipment. The short answer to this question is to make clusters of arrows on the target and then 'chase the cluster' by adjusting your sights in whatever direction(s) the cluster is in. Adjusting the sight is counter-intuitive. You have to adjust the sight in the direction of the cluster. Many beginners think if your shots are too high that you need to lower the sight. It is actually the opposite, you need to raise the sight upwards and then your arrows will go lower. Raising the sight lowers the trajectory angle of the arrow, lowering the sight raises the trajectory angle of the arrow. Huzzah for physics lessons. 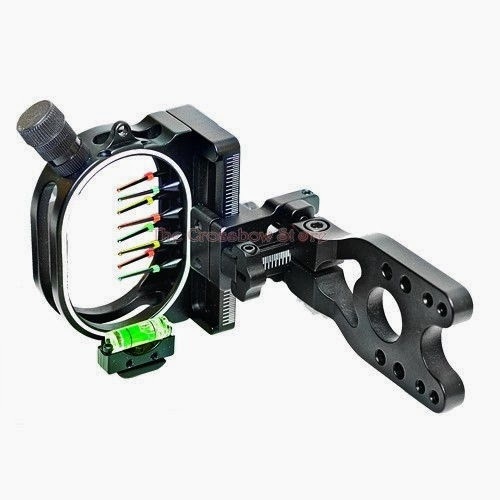 Fine tuning the sights up/down and left/right is more complex than that however so if you have a friend who has experience tuning compound sights, I strongly recommend you ask them to help you out - or if you live in Toronto you can hire an archery instructor like myself. Sometimes people also install other parts on compound bows improperly and they need to be adjusted first before you adjust the sight. For example the arrow rest should be tuned first, before you tune the sight. eg. I once met someone shooting a right-handed bow with a left-handed bow's arrow rest installed backwards on it. That was a case in which they needed a right arrow rest first, install it, tune it, and then they can start tuning the sights. Earlier this year I decided to start insisting on scheduling deposits because of several factors which resulted in me becoming disgusted in the behaviour of 'no shows'. First was the issue of people who don't show up at all for a scheduled session. That means I am standing there, twiddling my fingers and waiting for them to show up - and they never show up. This means I am out time, transportation costs and annoyed at the person who didn't show up for their personal training session. Second, for every session that someone skips, forgets, neglects there is usually one or more people who contacted me asking for that same time slot - which means not only have I had my time wasted and wasn't compensated for my time, but someone else was denied the chance to schedule their session. 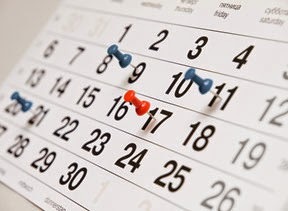 From March to October my schedule gets booked pretty solid so every time a client is a 'no show' it means there is a high probability that someone else was denied the chance to be trained. Third, by insisting on scheduling deposits this allows me to focus my efforts on the students who are serious about training / sincerely want to learn. If they skip sessions, forget to show up, etc then they are obviously not very serious about it. It also means that if a student does forget/skip a session that I am still compensated for my time. Fourth, at some point in the future I want to expand and hire other personal trainers / sports instructors who will be working for me - which means I will be responsible for their wages. If a client doesn't show up for their scheduled session I still have to pay the personal trainer / sports instructor. This means that I would be paying for wasted time out of my own pocket with nothing to show for it. I need to decrease any chance of financial losses by ensuring clients either remember to show up for their personal training sessions and don't skip sessions on a whim. Fifth, I have determined that clients who don't pay a deposit should not be guaranteed their time slot. If they are unwilling to pay the deposit, and someone else contacts me who is more serious and willing to pay the deposit for the same time slot then I have no reason to be financially loyal to a client who has yet to confirm their interest. Seventh, when dealing with people who haven't paid for their session and ask to reschedule their session less than 24 hours from the time of their session - this means someone else is denied a session that could have been scheduled during that time slot, simply because there isn't adequate time for me to contact people on my 'waiting list' and confirm their availability. Eighth, I have determined the best policy when dealing with people is to forgive all instances of illnesses / injuries / emergencies, provided I am given adequate notice. People who later claim that they wrote their personal training session time on a note and their "dog ate it" (or similarly bogus excuses) are not given the benefit of the doubt. If it wasn't an illness, injury or emergency then I don't care what the person's excuse is. At such times I point at my Terms of Service and remind people that I require at least 24 hour advance notice to reschedule a session. Attempting to reschedule a session AFTER the session's scheduled time has already happened, means the session already happened. Which means if it wasn't paid for, then I expect to be compensated for that time, or I have the right to deny service to people who refuse to pay for my time. 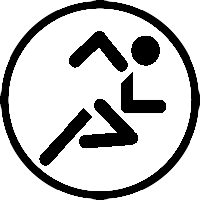 Finding ways to exercise when you are so used to taking the lazy way out can be tricky. Here are 12 ways to get extra exercise and to stop using the lazy way of doing things. Getting into the habit of doing these 12 things and you will burn extra calories and become healthier over time. #1. Instead of chatting or texting with friends on your phone, go meet up in person and go for a walk together. #2. Fire the dogwalker and/or gardener. Start walking the dog yourself and doing all the gardening yourself. #3. Walk to the grocery store instead of driving. If the weight is too much to carry, get a little cart. #4. Walk or bicycle to work if it is within a reasonable distance. #5. Instead of picking up the kids after school with the car, walk to the school, meet them, and then walk home. Same goes with your morning routine of dropping them off. #6. 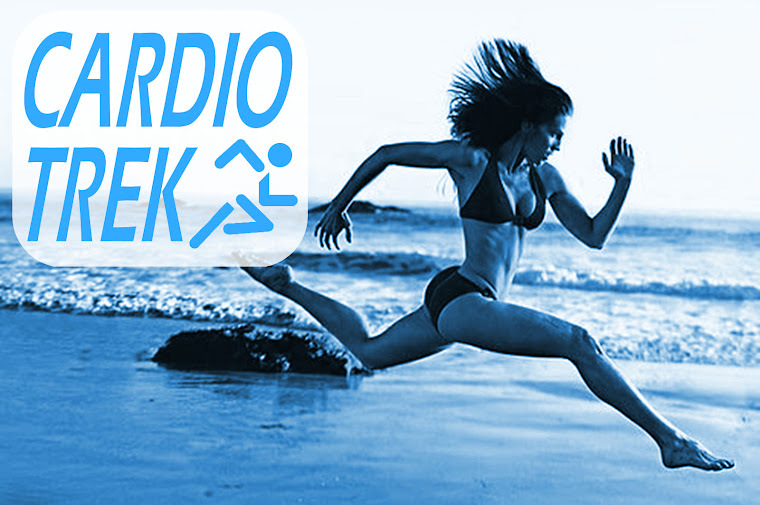 Jog to wherever you are going to for your lunch break. You can walk too, but definitely don't take your car. #7. Don't email someone a memo if they are in same floor of your office building. Deliver the message in person. #8. Fetch your own drinks or snacks when at work. Don't ask someone else to bring them to you. If someone offers to fetch them for you, ask to go with them. Eat healthy!!! #9. If you have a gym membership but are feeling too tired after work to go to the gym, go anyway. When you are tired you should still go. #10. Set your alarm clock so you get up 30 minutes earlier. Use that extra time to exercise. #11. Want to relax? Turn off the TV and go for a relaxing walk outside instead. Take the camera or the family dog with you. #12. Do the household chores yourself. Don't hire a maid or a cleaning service. "When first you don't like jogging, try again. And when you still don't like jogging, keep trying. Eventually if you keep trying long enough you will love jogging." - Charles Moffat, Personal Trainer. But seriously, making up exercise and diet quotes all the time is a bit silly. Let the history buffs quote me later. And I think that is all of them. Two years worth of exercise quotes. I think I will even setup a new Exercise Quotes topic label for people who only want to browse quotes to feel motivated to exercise and eat healthy. 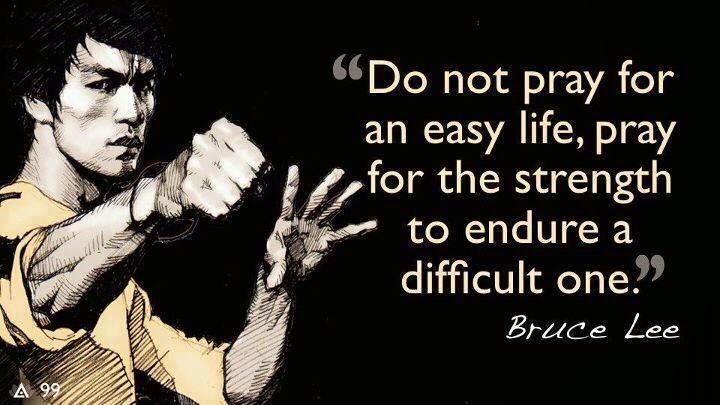 I may add more exercise quotes in the future, but for now I am going to take a break from posting quotes and focus instead on exercise/dietary advice. Don't get me wrong, I find the quotes very useful for people who need motivation (and they're very popular) but I am not trying to win a popularity contest here. I am trying to help people to exercise, eat healthy, live longer and be happier. 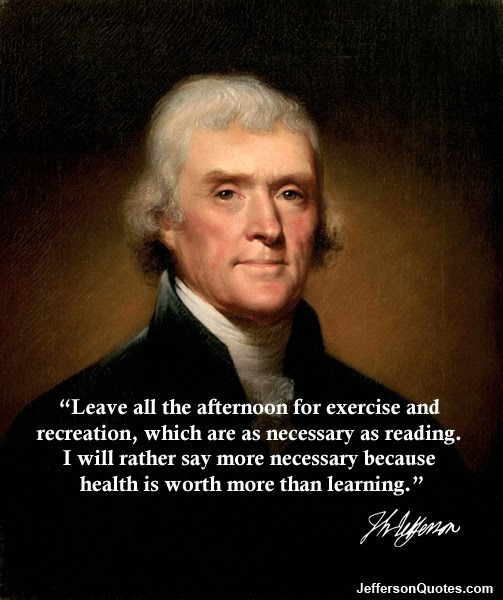 And now for two of my favourite quotes by Thomas Jefferson and Bruce Lee. Happy exercising!